Matrix Free standing stove offers a hot look with even hotter heat! 75,000BTUs brings up to 2,100 sqft a cozy feeling and a modern look to your home. 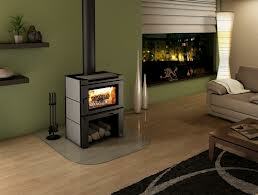 Compared to the soho this stove offers a soap stone panel or a black finish. this stove comes with an easy to access ash pan with a safety lid. There is also an ultra queit crossflow blower with a variable speed controller.